To learn more and join the community, visit our Facebook Group. This past weekend Borne Home hosted the second bi-monthly Seacoast Red Tent. Our first event in November was a small group of women; tears and laughter flowed in abundance. This time around we had a full room of women and babies sharing their stories. We met in the kitchen, taking tea and sharing snacks until we came together in the red tent. We began by breathing deeply, centering ourselves and then we sat and waited. One after another, women spoke their stories. There was laughter, there were tears, there was the expansive opening that comes from being heard. Women shared things that they had never let pass their lips before, and we received them without judgement. This is a red tent. To sit in shared space and listen to one another. We learned that we want to continue doing Red Tents, that as a community of women it is a need that we are determined to fill for ourselves. 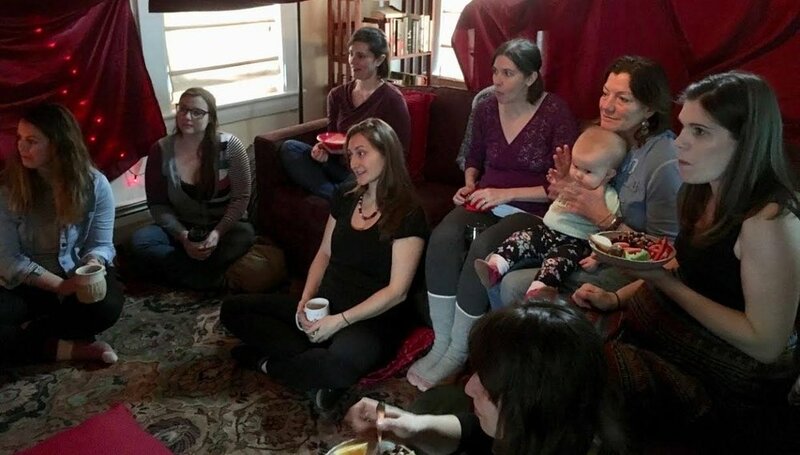 I suppose I knew that already, which is why Jo of Seacoast Birth Network and I have been working so hard to begin these projects, but to have it affirmed by our community is something different entirely. A room of women, birth professionals, mothers, friends, chiropractors, who looked at me with their eyes glowing, smiles stretching, and arms reaching to embrace me as they left. That is community, that is tribe, that is safety, and kindness and home. When is the next Seacoast Red Tent? Our next Red Tent will be held on Saturday, March 24, 2018 at 23 Morse Street, Berwick, ME 03901. RSVP to our Facebook event HERE. We hope to see you there. Bringing the women of the seacoast together bi-monthly to share their stories around conception, birth, and the postpartum period. "The Red Tent has a history, but what is it? There are thousands of women across the globe who are bringing forth their gifts as Red Tent leaders in their communities, but where did this tradition come from? “The Red Tent” was novel by Anita Diamant, published in 1997 that gave us a story of women who come together in a menstrual hut, known as the Red Tent. The Red Tent movement has a seventeen-year history, but connects to thousands of years of tradition of women honoring women and creating a world that embraces honesty, and respects for others, our daughters, and ourselves. We are in a new era of history. The healing of our planet is the priority of many committed visionaries. We understand that we are on a precipice and by building a woman-honoring culture we can create a huge paradigm shift one Red Tent at a time."